The ambassador, Sir Andrew Buchanan, found on his arrival in Vienna in late 1871 that the owner of his leased residence on Herrengasse was keen to see him out of it by the end of 1874 so that it could be sold. Buchanan’s first attempt to move the embassy, to accommodation in part of the Rossamovsky house and gardens, fell through. His next idea, knowing that capital funds from London were scarce, was an arrangement with a bauverein, or building society, for their construction of a house which could then be taken on a long lease at a rent not exceeding his allowance. London was wary but after a few skirmishes (described in Room for Diplomacy pp.118-120) Buchanan identified both a suitable bauverein and an able, busy and fashionable architect, Viktor Rumpelmayer, an Austrian born in Bratislava. The pragmatic Douglas Galton, director of works at the Office of Works, visited Vienna and concluded that the Office of Works should itself buy both the land and the house once the bauverein had completed it. The scheme proceeded on that basis, with relatively few hitches and, thanks to favourable movements in the rate of exchange, out-turned in 1876 well within the £42,000 estimate that had been laid before Parliament. Defective sanitary arrangements were remedied in 1893-4; electric light was installed 1897-8, at a cost of cost £600; and the lift was installed in 1906. 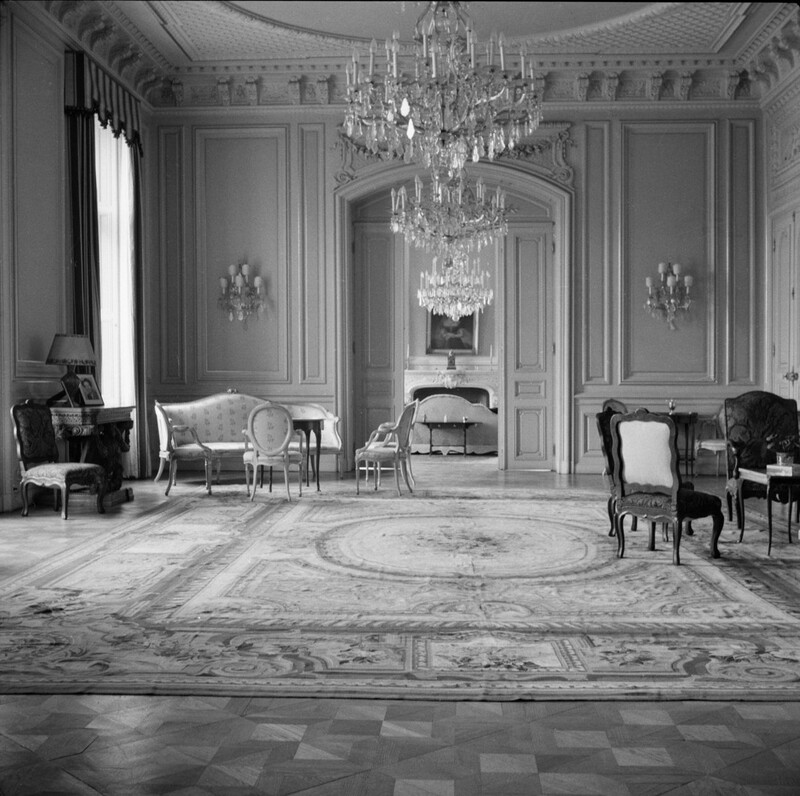 The Large Drawing Room, 1958. Buchanan first raised the idea of buying the plot of land immediately on the other side of Jaurèsgasse in 1874, mainly to provide a room for 150 people for Divine Service on Sundays. This was customarily held in a room in the ambassador’s house but the entrance hall in the house then under construction would only seat forty. The asking price was 40,000 florins, about £3,500, and the Treasury refused. Buchanan tried a new approach in mid-1875, telling the Foreign Secretary, Lord Derby, that a garden with trees across the road would enable ambassadors to remain in town during the summer. He said that he had thought of buying the plot himself, but the price had risen too much. He suggested, however, that it could still be met from the unspent balance of the £42,000 figure approved by Parliament for the new house. The Office of Works was urged by the Foreign Office to react both favourably and quickly because the vendor needed an answer before 1 August 1875: “Without wishing to offer any positive opinion upon the advisability of the purchase, Lord Derby thinks it right to observe that it is a decided advantage to the public, irrespective of the convenience of the Ambassador himself, that the latter should reside in Vienna throughout the year”. Buchanan chimed in with “However desirable it may be that an Ambassador should reside in town during the summer, he could not be instructed to do so, and it is only therefore by making the house, as far as possible, a comfortable summer residence that he might be induced to reside in it during that period of the year”. This argument worked and the Treasury approved the purchase on 29 July 1875. Rumpelmayer was promptly commissioned to design an Anglican Church to put on the site at Jaurèsgasse 17 – 19, where it would now, as the Austrian government’s permission required, be under the protection and jurisdiction of Her Majesty’s Embassy. Christ Church was opened on 8 July 1877, shortly before Buchanan left Vienna. The balance of the land bought in 1875 that lay west of the strip beside Jaurèsgasse occupied by the church and the small garden was sold to Baron de Burgoing in two parallel strips in 1891 and 1893. Some of the proceeds found their way to improving the house, including the drains. After Germany’s annexation of Austria in March 1938 and the withdrawal of the legation, there seemed little reason to retain the Metternichgasse house. It was therefore sold to the Nationalsozialistische Fliegerkorps in September 1938 for Reichsmarks 250,000, which went into the books as £9,152 14s. 5d. Damage incurred to the house during the war was mainly the result of a bomb on the servants’ wing at the rear but the main roof also suffered: the structural walls stood sound but all of the windows were broken. 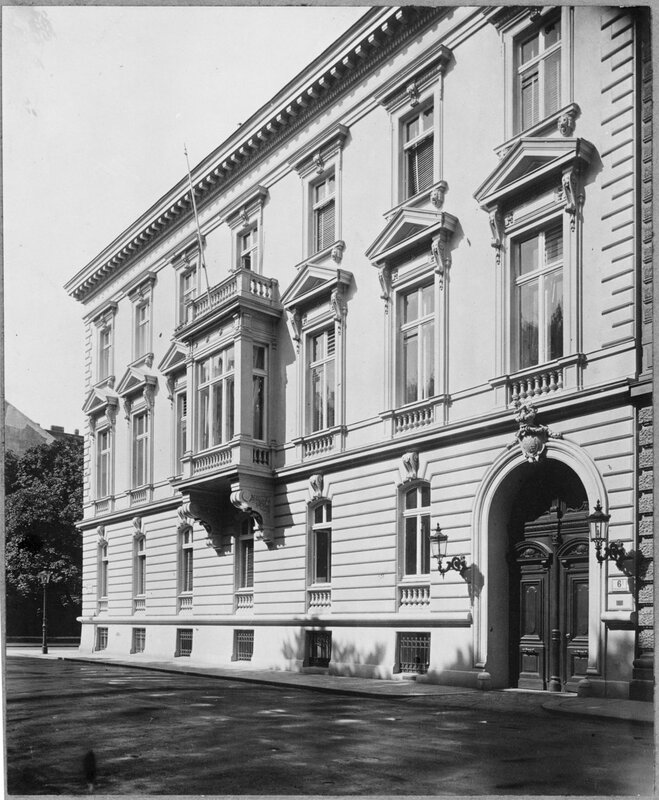 As early as February 1945, a member of the Austrian Control Commission and the minister-designate for Austria, WHB Mack, suggested the building should be requisitioned as a suitable future residence. Others were less sure, and some suggested demolishing it and starting again. Around 1948, an interim residence was established at 12 Metternichgasse and the offices moved into a requisitioned six-storey, turn of the century apartment block at 40 Reisnerstrasse, which was subsequently leased. 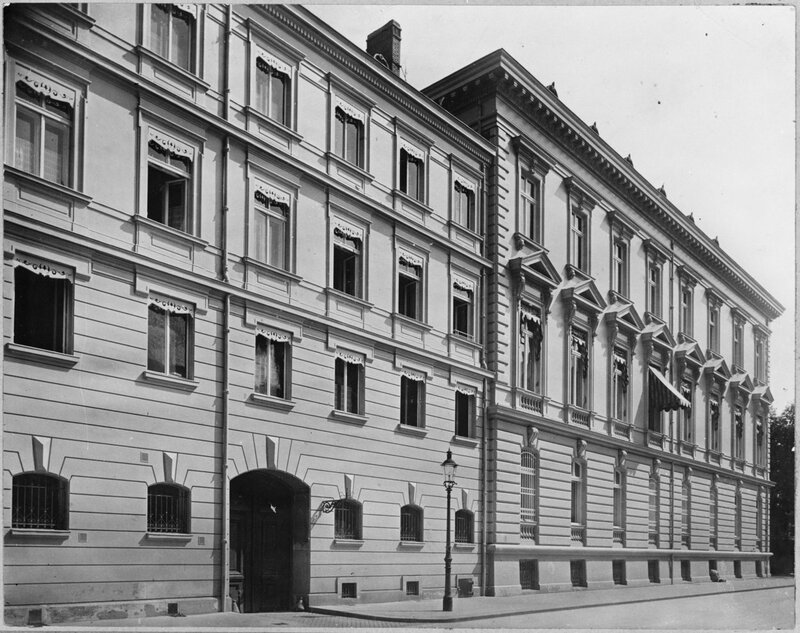 The debate about 6 Metternichgasse continued spasmodically while the building became the property of the Republic of Austria in 1948 and some repair works were done to the roofs. In 1950, two adjacent sites at the rear of the property, 27 and 29 Salesianergasse, were cleared of bomb damage and an estates surveyor visiting from London suggested that their acquisition would widen the possibilities for the use of the house in the future. In parallel with these discussions, a search was being carried out for alternatives, in which the Lanckoronsky Palace was the front runner. 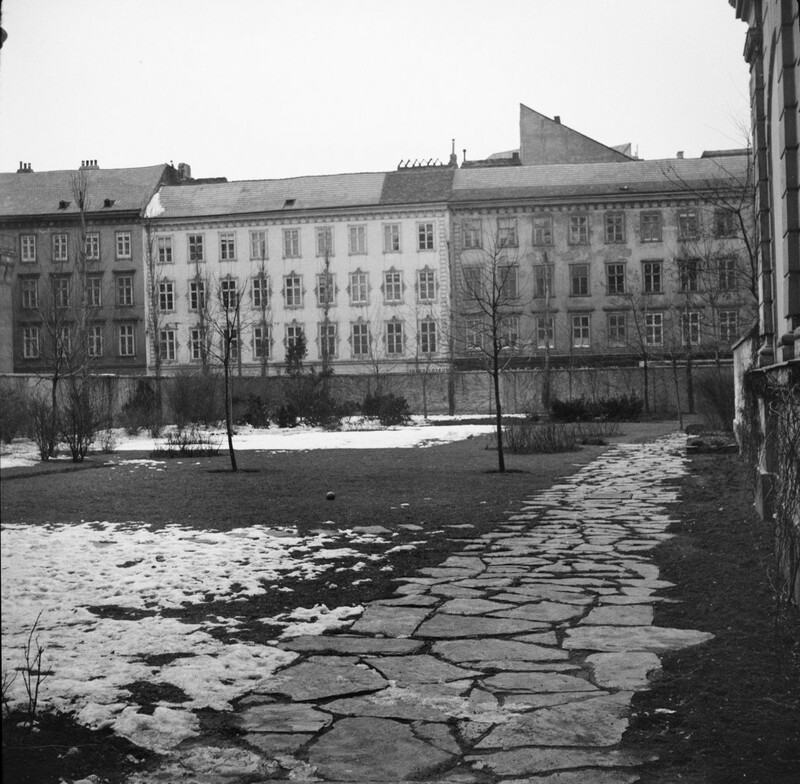 In July 1950, a Ministry of Works architect, Sirotkin, visited and unequivocally recommended re-purchasing and repairing the former residence, and buying the Salesianergasse sites. Meanwhile, in the context of exploring the mechanics of re-purchase, the Ministry of Works argued that the 1938 transfer was a ‘dispossession’ within the meaning of a recent law and learned that, in order to avoid the taking of evidence and further investigations, the Republic of Austria would agree to restitute the property provided that the purchase sum was returned. It was eventually agreed that 6 Metternichgasse should once again become the residence. A Settlement Agreement was signed to this effect on 26 October 1950 and the £9,152 14 . 5d. paid back. 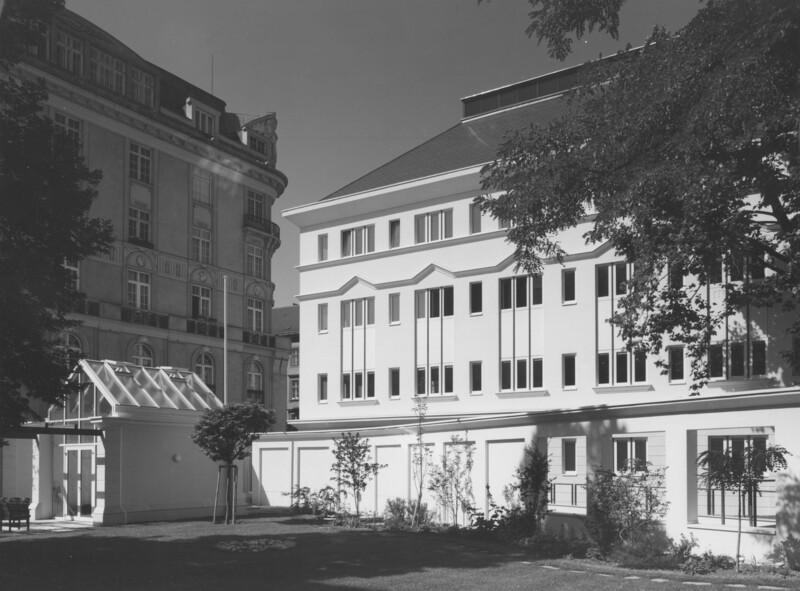 The Salesianergasse sites were bought for about £5,000 on the same day “to preserve the amenities of the embassy” and quietly took up the role of providing a larger garden. Re-instatement works cost about £80,000 and the building resumed life as the British residence when Sir Harold Caccia took up occupation as ambassador in 1952. 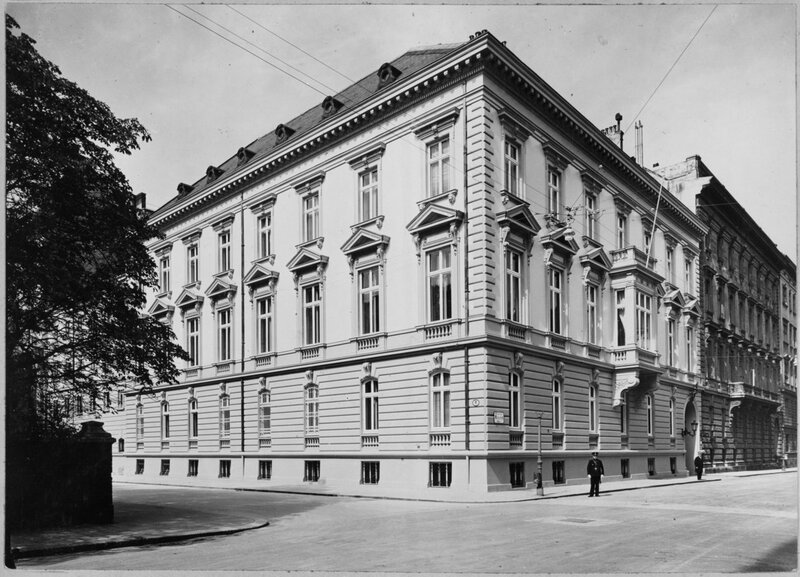 By the early 1980s, 40 Reisnerstrasse was overcrowded by the three British missions that it housed: the embassy; the UK mission to the three UN Organisations in Vienna; and the UK delegation to the negotiations on Mutual and Balanced Force Reductions. The lease of the building was also due to expire in 1989. 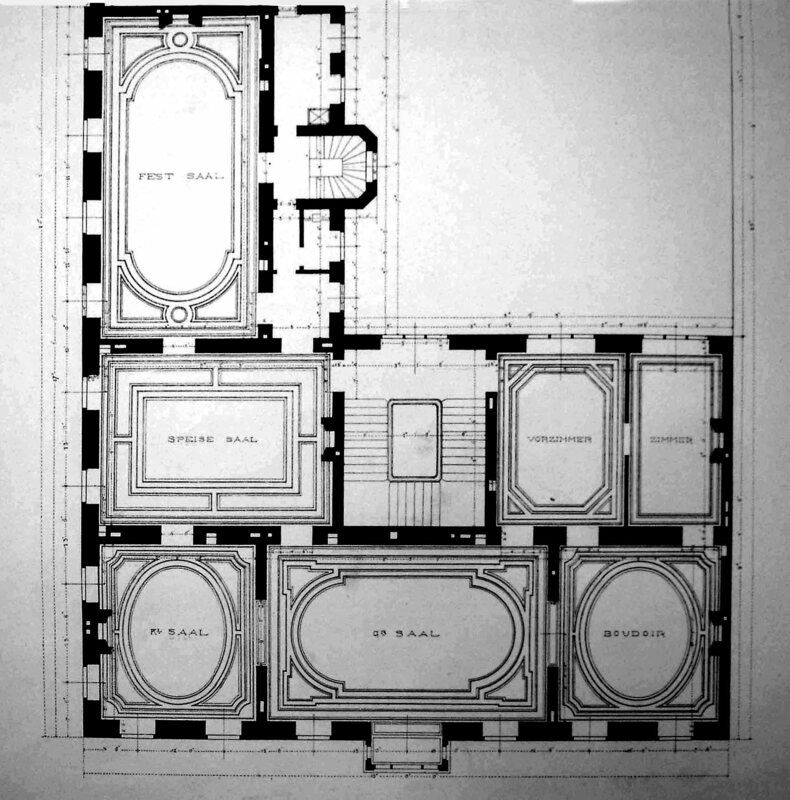 Building new offices in the large residence garden, notwithstanding the vehement opposition of the incumbent, was the obvious solution, and at the same time presented the opportunity of making better use of part of the overlarge residence by using it for offices. 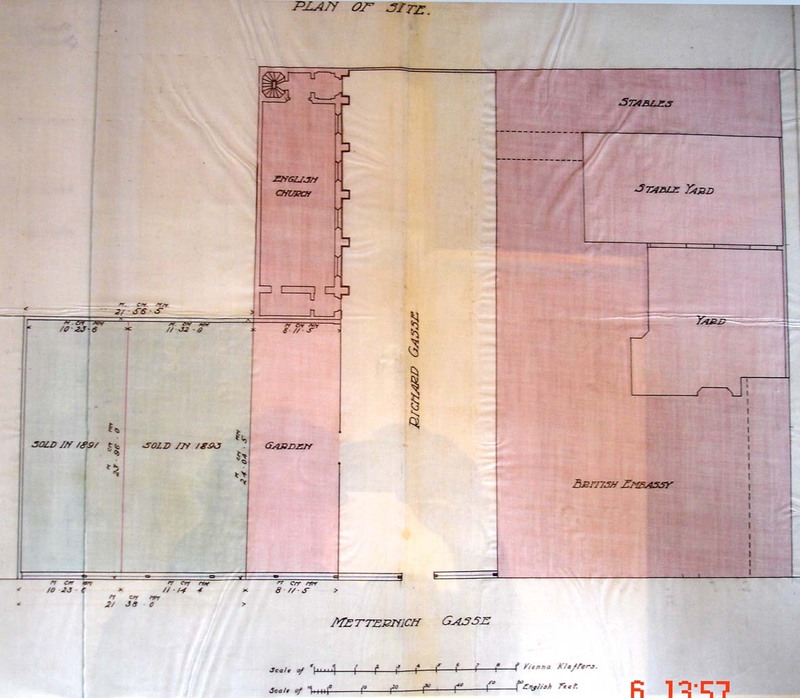 The scheme was sketch designed by Stephen Quinlan, an FCO in-house architect, taken forward by executive architect by Dr Sepp Frank, and built by contractor Ed Ast. 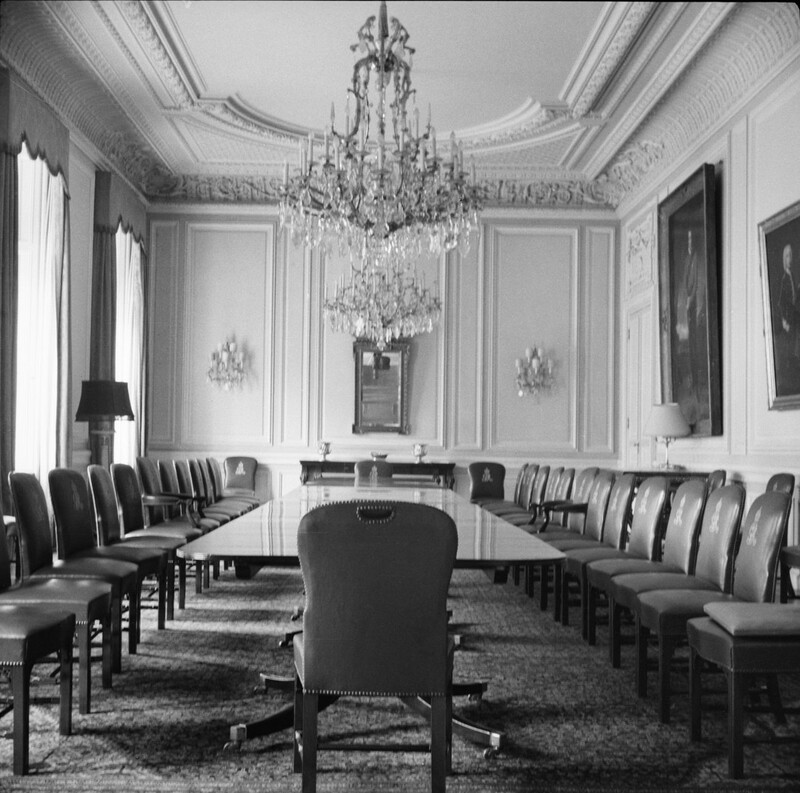 The building was occupied in October 1988 and officially opened by the Foreign Secretary, Geoffrey Howe. Embassy building, designed by Viktor Rumpelmayer and completed in 1875, on corner of Metternichstrasse and Jauresgasse. Location plan (dated 1930), showing original land to the right of the lane (later Jauresgasse) and 1875 purchase to the left, on which the Church was built. The offices, completed in 1988, viewed from the residence garden.